One of my favorite things about the holiday cooking is using all the fresh, seasonal produce that give flavor, character, and color to traditional holiday dishes. Tart, ruby red cranberries are beautiful to look at but also very easy to cook with. Did you know that they are native to North America? No wonder they are a staple of our traditional Thanksgiving table. Cranberries are one of those multi-faceted fruits that can be used in both sweet and savory dishes. Native Americans used them as a food source, but also found many other practical uses such as making fabric dye and using them in medicinal ways. Today, cranberries continue to be a popular fruit for culinary creations and modern medical experts tout their healing properties. Not only have they been proven to help prevent urinary tract infections and gum disease, but they are also one of the highest ranked foods on the USDA’s antioxidant scale. Add this to the fact that they are fat free, cholesterol free and low in sodium and you have one stellar berry. You’ll only find fresh cranberries from the end of October through the beginning of January in your grocery store and I prefer cooking with the whole, undried berry. Since they are only available fresh for such a small window of time, I stock up since they are only about $3 a bag and keep a few months tightly wrapped in my freezer. Happen to have some cranberries in the freezer? Use them in lieu of ice cubes in your party punch or summer cocktail at your next soiree to wow your guests. There are many ways to savor the taste of cranberries all year round. You can reap the benefits of cranberries in a variety of ways. Of course, you can eat them raw, but without added sugar these berries are extremely tart. If want to cut the “pucker” factor, I suggest cooking them with water and agave syrup to make a topping for meat, fish, or even to add to your morning smoothie. If it’s the liquid variety you’re craving, try adding 1/4 cup of cranberry juice to your sparkling water for a tasty twist on your old standby without loading up on a lot of calories. If you have trouble finding the fresh variety, try dried cranberries, often called “craisins”, in your salad or cereal. Have a favorite recipe that calls for raisins? Try using dried cranberries instead, but always use dried fruit in small quantities since it is high in concentrated natural sugars from the drying process – that makes them high in calories as well. Fresh cranberries are also great for baked goods. For inspiration, check out my delicious cranberry orange muffins! 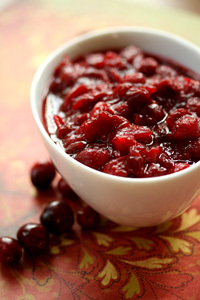 And of course, we cannot talk about cranberries without discussing cranberry sauce! You’d be hard pressed to find a table these holidays without this delectable side dish. And for good reason – it’s simply delicious with turkey! If you want to add a little zing to your cranberries this holiday season, then try my version – the added spices add flavor without fat. Learn more about why foods that are high in antioxidants are considered to be so healthy. 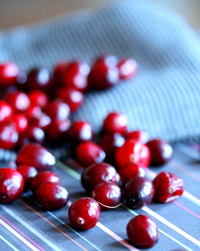 Are you a big fan of cranberries and want to include more high anti-oxidant foods in your diet? Then you might also like goji berries. Check out my blog post to find out more about these unusual berries.